We're proud to be recognized as one of the top power sweeping contractors in America. We have the training and expertise to provide a premium product to each of our customers. When you utilize Commercial Power Sweeping to handle your pavement sweeping, you'll get superior results each and every time. At Commercial Power Sweeping you'll find that a commitment to quality services at reasonable rates -- backed by excellent customer service -- are our #1 priorities. And, for those tough jobs, you'll also see there's a reason that POWER is our middle name! We're the 2nd sweeping contractor in America to earn the coveted Certified Sweeping Company status through NAPSA and are a founding member of WorldSweeper.com's Ethics in Sweeping Program. We perform all types of sweeping, including indoor scrubbing, parking lot sweeping, and streets and construction (including milling). We know the latest regulations on TSS, Stormwater, NPDES, and use of sweeping as a BMP under the Clean Water Act. Our training includes the important concept that we are 'the eyes and ears' of our property managers. When emerging needs or unusual situations are spotted, such as lights out, illegal dumping, graffiti, etc., we contact the customer. At the customer's preference, this is done via next-day email (with photos) or via telephone customer contact. In the rare instances when needed, our employees are trained to summon emergency personnel. We use innovative and late model equipment, and keep them maintained so they will perform to manufacturer’s OEM specifications. This is very important, since parking area sweepers are vacuum-based. As a result, their performance level drops -- and noise level increases -- when they are not kept in tip-top condition. 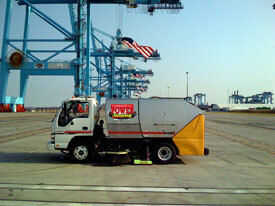 That's why our company mandate is to keep our sweeping equipment maintained at OEM specs. We also provide: asphalt repair, striping, pressure washing, seasonal banner installation/removal, large debris removal and much more. We offer free professional assessments in our service area. 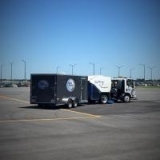 Visit our website using the link shown at the right, or go to www.CommercialPowerSweeping.com. Family owned-and-operated since 1986. 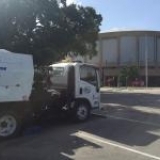 If you need a sweeper or other of our property maintenance services done in our market area of Virginia or North Carolina we invite you to give us a call to request a FREE assessment of your needs.